It is hard to compare corporate and state social performance without making some fairly broad assumptions. For companies, we can measure how they treat the environment, their communities, and their employees. We can also assess how well companies are governed by their investors, boards, and management teams. For states or other communities, we can measure things such as education levels, unemployment levels, divorce rates, or how many crimes are committed. If we perceive a relationship when we compare these measures, we may not be able to know if companies improved the state it lives in or if the good attitudes of the state have been imbued into the company. We also know that most large companies operate in multiple states and other countries, around the world. So, a good company could create positive change in many places other than around its headquarters. CSRHub has full ratings on 1,453 US companies. The database also has partial ratings on another 1,880 US companies and organizations. There are entries for 46 of the 50 states, plus Washington, DC and Puerto Rico. 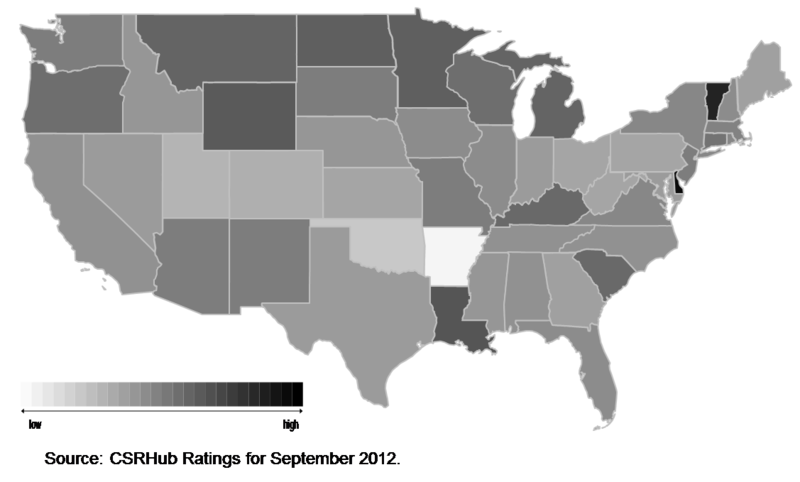 (There are no fully rated companies from Alaska, West Virginia, or Wyoming and only two for New Mexico.) 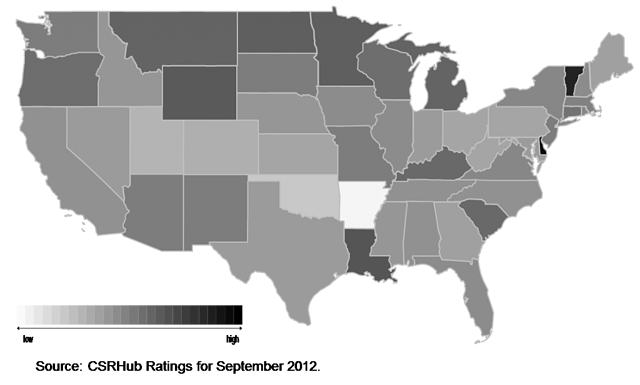 If you do a simple average of the overall corporate social responsibility (CSR) scores for the companies in each state, you get an interesting “map” of corporate responsibility behavior, by state. 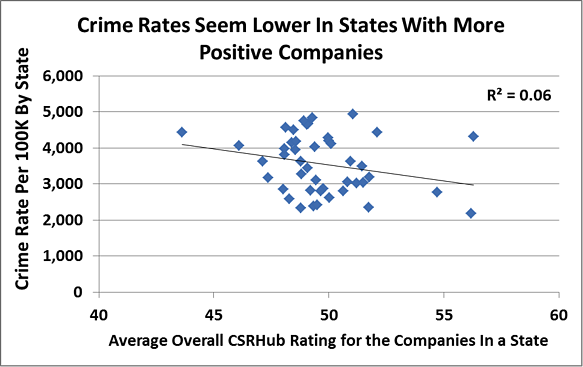 Can we see connections between company performance and a state’s “livability?” Yes, we do see correlations between average company social performance and four livability measurements. 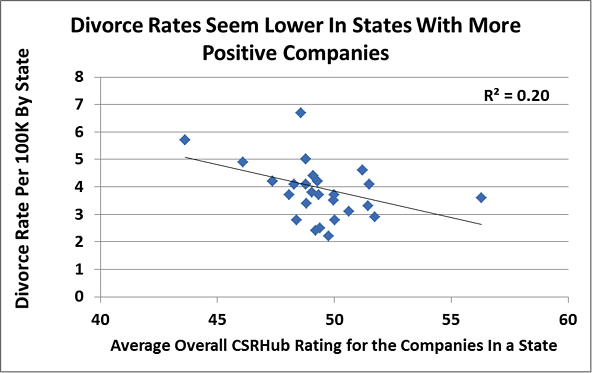 Crime rates, divorce rates, unemployment rates all seem lower in states with more positive companies. Average education levels are higher in states with more positive companies. These are only four measures—but all four suggest that positive companies are associated with more livable states. Most of the correlations are small—suggesting that company behavior contributes only a small amount to changes in these social issues. But, there certainly seems to be an encouraging connection—one that could start to drive governments to push the companies they supervise and regulate to improve their social performance. 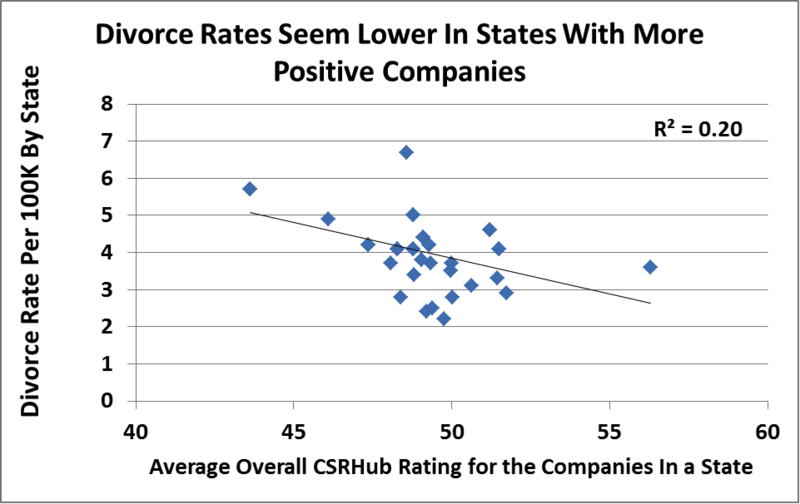 One source of “scatter” in these charts is that the data on some states include “outliers”—companies whose social performance is either much worse or much better than the average for that state. When we have many companies in the average, these divergences don’t affect the state average that much. But, when we have only a few companies to consider, a super or subpar performer can shift the numbers. For instance, the 202 companies in California have an average rating of 49.3. See a recent Business Insider article on the 20 most socially responsible companies in California. Companies in the high 60s like Gymboree, Dole Food, and Callaway Golf are balanced by companies in the low 30s like Sigma Designs, VeriFone, and Wesco Financial. Although South Carolina appears to have a higher overall score than California, it has only seven companies in the CSRHub system. Two strong companies—Blackbaud with a score of 69 and World Acceptance with a score of 64 “rescue” South Carolina. Without the support of these two companies, this state’s score would drop to 47 from 51.